The girls and I were talking about Coke over lunch today. The drink… A likes it, N doesn’t. I like it once in a blue moon. When I was young, I drank it by the gallon, which probably explains the state of my teeth. 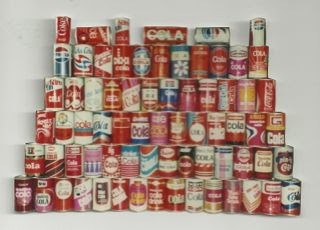 But it wasn’t just Coke or Pepsi, it was a whole range of cola brands which seemed to be everywhere in 1970s UK. So much so that I used to collect them and still have a box up in the loft back home and, embarrassingly, a photo - see right. So let’s hear it for Woolworth’s (Winfield), Sainsbury’s and Tesco’s home brands, together with weird and probably short-lived names like Merry Maid, Pin-Hi and Coola. Is there still such variety? Perhaps not in the UK these days, but globally – as a quick wiki search reveals - there seems to be a vast array: Afri-Cola and Fritz-kola (Germany), Parsi Cola (Iran), Big Cola (South America), Kiwi Cola (guess) and - my favourite - Cola Cola (Albania) are just a few of them. And what about China? Apparently there’s something called Future Cola, though I’ve not seen or tried it.